Diapers are a basic need for children, as essential to their health and well-being as food, shelter, and a parent’s love. Yet, many families struggle to afford diapers, and few resources exist to help them. Diapers cannot be purchased with food stamps and are classified with cigarettes, alcohol, and pet food as disallowed purchases. Diaper needs impact the physical, mental, and economic well-being of children and parents. Most child care centers require parents to provide a day’s supply of disposable diapers. If the parents cannot provide the diapers, their children will not be able to attend; therefore, enabling the parents to not go to work or school. Most immediately, an inadequate supply of diapers forces many parents to leave their child in a soiled diaper longer than is appropriate, which frequently leads to diaper rash, and may cause staph infections and urinary tract infections. When parents run out of diapers, they are forced to withdraw their children from child care. At a rate of 6 diapers per day per child, diaper wearing children in poverty in the US require more than 5.8 billion diapers annually to keep them clean, dry, and healthy. The drive will run through Friday, September 30th. Diaper donations of all sizes can be dropped off at any First Community Bank location in Mobile County or the United Way office located in downtown Mobile. 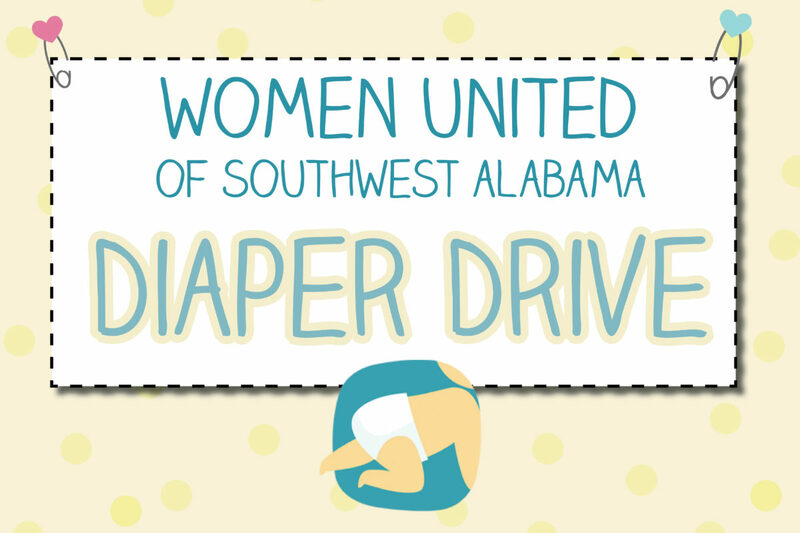 For more information or to contribute a financial donation towards the diaper drive, please contact the United Way of Southwest Alabama office by calling (251) 433-3624.